Its noon on Thursday and we haven’t had power since 8:30 this morning. The latest rumor is that it’ll be back on by 5:30 this evening. There’s not much of a parallel power grid here so when they make repairs on the line along the coast road (or a careening bus takes down a pole) everything is down along this stretch of the coast. It’s hard to teach IT when the computers are dark. 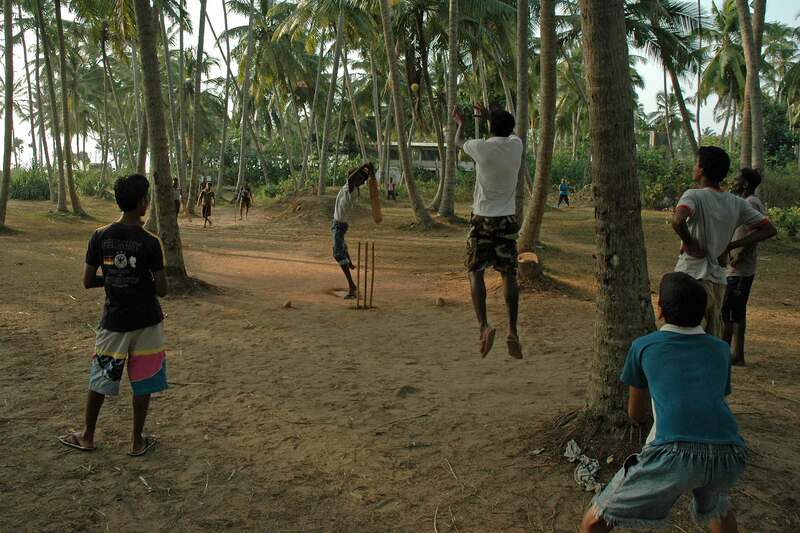 Some of you seeing the photo of the cricket match in the coconut trees asked why they hadn’t cleared the jungle for crops. This part of the island is low lying coastal plain with a few feet of sand and clay on top of ancient coral from when the seas were higher. There are ponds of standing water around here where the coral has been dug out for making cement. Until recently it had been a common but illegal practice to dynamite the coral reefs in shallow water for the same purposes. It still goes on but to a much lesser extent as they try to develop an ecotourism industry. So it’s hard to grow the kind of food crops that we are familiar with. Tomatoes, cabbages, squash and the like can only be grown in the relatively small mountainous area around Nuwara Eliya at about 5,000 feet where they have a relatively cooler climate and reliable rain fall. A few miles further inland from here there are large areas of padi rice. The farmers there benefit from reliable irrigation systems based on manmade holding lakes which were first developed nearly 2400 years ago. Once of the kings responsible for this infrastructure made the proclamation, “Let not even a drop of rain water go to the sea without benefiting man”. Rice is a staple food here and comes in several varieties including rough, red country rice that is quite healthy. Rice is subsidized to a large extent by the government and is available at government distribution centers along with chilies, cooking oil and a few other essentials at greatly reduced prices. This program is supposed to be accessible only to those at the lowest income levels. In fact, whether you are on the list or not is more often determined by how much favor you have curried with the local political boss. Many people who are much better off (and who voted the right way) are recipients while their poorer neighbors are not. Cooked rice is brought to the temple in full, 2 gallon buckets every morning and afternoon. Only a gallon or so maybe brought in the evening for me and the novices. When the police, army and other “dignitaries” come by for a free lunch it is usually all consumed. Otherwise, large quantities are thrown into the dogs’ dinner bucket. As for the jungle, it is a bountiful source of all things good. Sri Lanka, like India has a strong tradition of Ayurvedic (traditional) medicine for which the jungle provides many plants for oils, salves and powders. Bananas, papayas, jack fruit, bread fruit grow with abandon. There are countless other fruits like wood apples which have no equivalent in our world. There is a tree that produces a long bean-like pod that is prepared much like green beans. And there are many plants that are used as herbs and flavorings. Much of this is free for the taking. The ancient kings gave enough land (and villages) to certain temples in order that they could be self sustaining. Much temple land was parceled out by the British, much of it for their own benefit, as they first tried to establish coffee plantations here and failed but later succeeded in the tea business. Some coconut, rubber, cinnamon, and suchlike plantations are still run by independent companies or the government depending on the winds of nationalization. Life on these plantations is some of the harshest here. Most of the villagers here live on ¼ to ½ acre plots of land that were owned by their parents and grandparents. The houses we built were mostly constructed on these home sites. Twenty one families that had homes within 100 meters of the ocean were not allowed to rebuild there. They now live in the 21 houses we built behind the temple on land we purchased from an unused cinnamon plantation. They and their children can remain there in perpetuity but they cannot sell the houses (to prevent profiteering on donated houses). So they are in limbo as they still own their original plot but cannot use it. No one will buy it because they wouldn’t be allowed use it either. The owners can’t even borrow against it. Some think this a plot by the government and developers to keep the beach front open for new resort construction. I haven’t seen any signs of that yet. Some large areas of land nearby are owned by the government. Some may have a resident care taker, others not. So people can easily access the food stuffs I mentioned earlier. And of course, there are the coconut palms which abound in many varieties including the King Coconut which I am fond of. I believe I mentioned it in a previous message. The coconut serves many purposes here. Its milk is used in cooking as is its white flesh. Shells are broken in half and the meat scraped out in small flakes. Mixed with diced chilies this becomes coconut sambal. The outer husks are dried, shredded into individual fibers, spun into yarn and rope and woven into mats. There is an ecological demand for larger mats to be used in controlling hillside erosion. The boys here at the temple keep a few clumps of fiber in the soap dish for scrubbing pots. They also use the shells as mulch around plants; tie them to trees to serve as anchors for gorgeous parasitic plants and throw them in the firewood pile. Just today, we were setting on the front porch trying to catch a little breeze when Buddhika decided it would be a good idea to have some coconut. He’s not as skilled a climber as Sumida, our usual coconut picker, so he went onto the roof from an upstairs window and knocked 5 of them off a tree with a long pole. 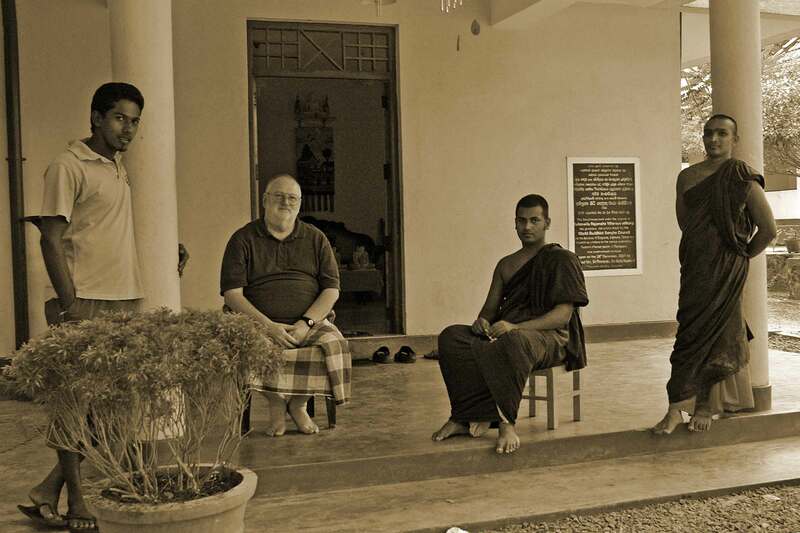 We drank the juice and ate the flesh dipped in jaggery; a syrup derived from the tops of yet another variety of palm. Later, the 3 senior monks and I walked down to the beach to try to catch a better breeze. It was so hot that I had shifted to my sarong after lunch. So we walked along the beach for a while with the sea breeze blowing the folds of their robes and my sarong around our legs. We got back about 5:40 just as the power came on only 10 minutes past the promised hour. Have I said it was hot today? It really was. Even the monks covered their heads with their robes when they had to go out. Without power for the PCs, classes were canceled and there wasn’t much else to do. So I alternated between short naps and long showers. The skies were darkening this afternoon and everyone is expecting a big rain storm tonight. I am sensitive to my words and actions being a contaminant to the local culture. Although I must not be too concerned as I have introduced them to the Internet. May all the saints of all religions forgive me! As an example, when I first arrived the eating table was covered with a thin sheet of plastic film that had been cut in a hundred place and burned in many more. But what the heck, I only set there for a few minutes each day. But Kokila was embarrassed and brought a nice piece of textile to put on the table. I told her she must be kidding. With 3 men and 3 boys in the kitchen, it would look like the dogs’ bed inside of a week. I said to wait and I would pick up some clear acrylic sheets at the hardware store when I was next in town. Well, there was none to be had so I bought a piece of patterned oil cloth instead. It’s used here as a floor covering and as a ceiling finish. Anyway, now that I’ve put it on the table everybody is constantly wiping up spills. Two days ago, a tiny knick appeared. When one of them discovered it, they all stood around pointing fingers at one another. Last week I brought home a few King Coconuts. But they seem to be self replicating for now I’m encouraged to have one at every meal including breakfast. I think my fondness for this coconut and the buffalo curd that I mentioned in an earlier message derives from the fact that I have never been served either with any form of chili concoction. 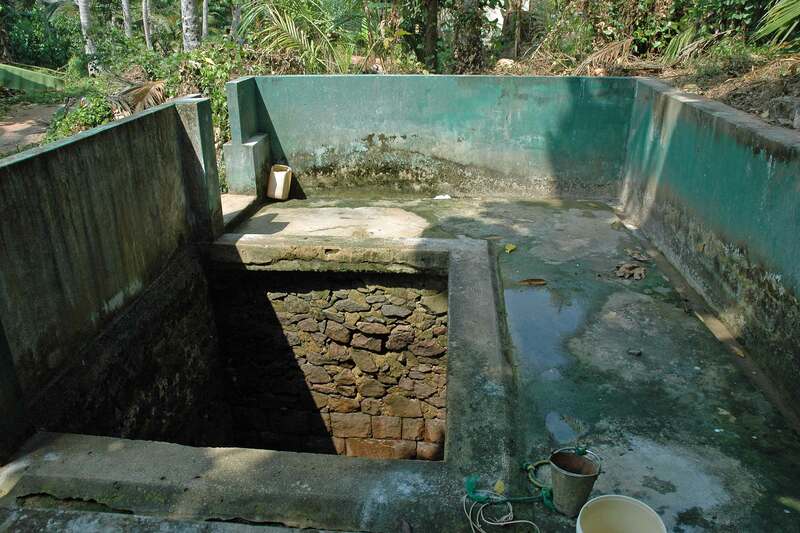 I’ve attached a photo of a public bathing area that was built by the temple generations ago. It’s at the base of the stairs leading down from the compound.